The following is the entire article by Edith L. Blumhofer entitled History Matters from the booklet issued in 2000 on the occasion of the 75th anniversary of Ridgewood Pentecostal Church, 457 Harman Street, Brooklyn, NY 11237. After five damp, gloomy days in Brooklyn, Sunday, 6 December 1925, dawned clear and seasonably mild. That morning, many New York City churches marked the four-hundredth anniversary of William Tyndale’s translation of the Bible into English. Those cel­ebrations, coordinated by the American Bible Society, were impressive but are long forgotten. Every year since, though, one group of Brooklyn Christians has recalled 6 December 1925 as a day to remember with special thanks. On that day, they first met as the Ridgewood Pentecostal Church. December 6 was a watershed in their corporate existence. Coming that far seemed a miracle, and the future beckoned, thanks, in large part, to the recent arrival of their new pastor, Hans Waldvogel. Over the next decades, the Ridgewood Pentecostal Church and Hans Waldvogel’s ministry became so inextricably linked that to look at one is to explore the other. The story of the Ridgewood Pentecostal Church has two beginnings that soon merged: the first, that of a small, struggling German mission in Brooklyn, can be recounted briefly; the second, the spiritual experience of Hans Waldvogel, is more complex but also more fundamental to the church’s enduring legacy. A German Pentecostal mission met for several years in a modest hall at 75 Patchen Avenue, part of a small, loosely knit Pentecostal presence in the New York metropolitan area. Known as the Full Gospel Mission, the meeting place stood in a neighborhood whose German population had recently swelled. In 1923 its pastor, John Baum, died, and in the following months most participants found other places to worship. By 1925 the few remaining families discussed closing the mission. Then a few people heard favorable reports about a young evangelist named Hans Waldvogel. They agreed to invite him for two weeks of meetings before they made a final decision to disband. He arrived on 28 April 1925, fresh from considerable success in a German Pentecostal church in Buffalo, coming not because he had no other possibilities but because he felt he should. The prospects seemed bleak: just fifteen people attended his first service on Wednesday evening, 29 April. Why the prospects changed—how a dying mission became the Ridgewood Pentecostal Church—is the story of Hans Waldvogel. Hans Rudolph Waldvogel—Johann on his first passport—arrived in the United States in 1907, the year that brought a record number of immigrants to American shores. The family came from Switzerland, and there the story properly begins. Hans Waldvogel was born to Adam and Anna Daehler Waldvogel in the small town of Herisau on 7 January 1893. He joined Anna, Gottfried, and Rose and would soon be followed by Lydia and Elisabeth. These sons and daughters always acknowledged the godly influence of their parents on their lives. Adam and Anna, each born in 1859 (he in Stetten and she in Senftigen, Bern), married in 1886 just after Adam completed his studies at the Baptist seminary in Hamburg. In their part of Switzerland, the Reformed Church enjoyed social and religious privilege, and Baptists had no status. Switzerland had never been kind to Baptists. In fact, Adam Waldvogel, with other teenagers, had taunted and heckled the traveling Baptist preacher who ultimately won him to Christ. Few in number, Swiss Baptists could not support their own seminary, and so their prospective preachers studied in northern Germany. Adam had been a forester and was also a noodle maker. Now he turned his energies to ministry among religious outsiders. From seminary, he and Anna took responsibil­ity for a small Baptist congregation in Hassenhausen, Germany, where their daughter, Anna, and son, Gottfried, were born. When an opportunity arose in Switzerland, the Waldvogels gladly returned to their native land. Their first congregation was in Herisau, a historic town, capital of Halb-Kanton Appenzell-Ausserhoden. But in those days, Swiss Baptist pastors did not have the luxury of serving one congregation. Preaching points in homes in the surrounding area kept Adam—later accompanied by his sons—busy most evenings. On long walks on the forest paths, the sons came to know and admire their father and received their first training for the ministry. Adam Waldvogel may not have been a fiery preacher, but devotion and piety marked his daily life. Anna was a cheerful optimist with abundant faith in God’s provision. Adam sometimes brooded and, during their second pastorate—in the village of Bülach, Kanton Zürich—became discouraged enough to consider leaving the ministry. Poverty drove him to think about other ways of pro­viding for his family, but it could not diminish the rich spiritual her­itage that the family enjoyed. Family devotions morning and evening, prayers and songs at the table, Bible and hymn memoriza­tion marked every day. The parents knew that “God had not given [them] any of the children for the Devil,” and they had the joy of seeing each accept Christ, be baptized, and assist in the work of the church. As Swiss Baptists their heritage—especially as expressed in its hymns—drew on the richly textured Pietism that, in its English forms, had produced Methodism and the Great Awakenings. The language of Paul Gebhardt and Gerhard Tersteegen shaped their faith. The Waldvogels were in touch through publications with con­temporary German evangelicals pursuing a desire truly to know God. They particularly valued Otto Stockmayer (1838-1917), whose writings and ministry in Switzerland and Germany revealed his deep commitment to holiness and spiritual power. Stockmayer’s simple-yet-profound message has a familiar ring to those who have known the Ridgewood Pentecostal Church over the years: “nichts von mir, aber alles von Christus zu erwarten.” This determination to expect everything from Christ rather than to rely on self marked Adam Waldvogel before it gripped his sons. Through annual Keswick Conventions in England, Stockmayer came to treasure the teachings of people like South African Reformed pastor, Andrew Murray; the English Baptists, F. B. Meyer and Charles Spurgeon; the Anglican advocate of a higher Christian life, Evan Hopkins. He helped popularize their writings among German-speaking people and influenced the Waldvogels’ perspective on contemporary evan­gelical teachings. Through Stockmayer’s paper, the Waldvogels first heard of Max Wood Moorehead, a missionary to India who would later influence Hans Waldvogel’s choices. The family also learned about the Pentecostal movement, followed its troubled early course in Germany, and heeded the warnings against it issued by respected German evangelical leaders under the banner of the Gnadauer Gemeinschaftsverband of which Stockmayer was a founder. Early in 1907 Anna Waldvogel’s sister, Rose Steinhaus, visited and urged the family to consider migrating to the United States. She and her husband had made the move, and she now longed for family nearby, especially for cousins as companions for her children. The Steinhauses lived in Chicago, a city teeming with immigrants, hundreds of thousands of whom spoke German. She persuaded the Waldvogels to see Chicago as a place in need of German-speaking pastors. In fact, the pace of migration made her plea especially timely. Across America, many denominations struggled to find pastors fluent in European languages. German Baptists had established a presence in the United States decades earlier, but, in numbers of churches and pastors, they could not keep pace with immigration. Adam decided to accept the challenge. The Waldvogels became one of thousands of families to leave Switzerland for the promise of America. In recent years poverty and hunger had been so severe that the Swiss government had offered money to assist those who chose to leave. The Waldvogels did not receive a government bounty; rather, ministry to their compatriots beckoned them to Chicago. Hans and his oldest sister, Anna Martha, returned to the United States with their aunt and cousins. They left Bremen on the Kronprinzessin Cecilie 10 September 1907. The rest of the family came in November, and Adam soon settled them into the parsonage of Immanuel Baptist Church on Chicago’s North Side (not far from Wrigley Field) and began his work in the small German church at the corner of Newport and Robey. Gottfried Waldvogel had begun assisting in ministry in Switzerland. In the spring of 1908 his aunt, Rose Steinhaus, paid his way to the German Baptist Seminary in Rochester, New York. A department of the Northern Baptist Seminary at Colgate-Rochester Divinity School, the German Baptist Seminary enjoyed national renown because of the pathbreaking work of its premier professor, the controversial Walter Rauschenbusch. A man of deep piety, Rauschenbusch worked hard to evangelize German Americans. He collaborated with Ira Sankey to translate gospel hymns and edit hymnals, and he manifested a passion for German-speaking immigrants that drove him to challenging inner-city min­istries. But he had recently discovered a larger theological interest in transforming society and had made what he called the Social Gospel central to his message. Uncertain that the “old gospel” could meet the challenges of the modern world, he devised alterna­tive categories for understanding the Christian task, categories driv­en by his view of the kingdom of God. Gottfried Waldvogel felt uncomfortable in this environment and left the seminary to return to Chicago after the spring semester. Now he found opportunity in a busy mission to Chicago Jews established by the prominent Methodist pastor and author, W. E. Blackstone. The mission had close ties to Moody Bible Institute and to the Christian and Missionary Alliance. The American Jewish population grew exponentially in 1907 as Jews poured in from southern and eastern Europe. The Chicago Hebrew Mission gave Gottfried Waldvogel valuable experience and also put him in touch with influential American evangelicals who would help mold his future. Hans, meanwhile, went to work at Spaulding & Co., a large custom jewelry firm in Chicago, where he became an expert in plat­inum mountings. He assisted his father at Immanuel Baptist Church, where he took a Sunday school class of young boys. Within a few years he was Sunday school superintendent, choir director, and leader of the young people’s group. He occasionally collaborated with Gottfried to organize street meetings. And at every opportunity, he attended the Moody Church’s Saturday evening Bible study, sitting under the ministry of William Evans. Drafted in 1918 (although not yet an American citizen), Hans Waldvogel served briefly in the military where he signed on as a conscientious objector. Late in 1917 Adam Waldvogel accepted a call to Kenosha, Wisconsin, where in January 1918 he became the founding pastor of another Immanuel German Baptist Church. Begun as a home missions church in 1906, Immanuel incorporated when the Waldvogels arrived and paid off its 130-seat building in the first two years of Adam Waldvogel’s pastorate. Hans remained behind in Chicago but spent weekends at his father’s side in the ministry. The little Kenosha congregation flourished. Hans was a creative Sunday school teacher and an enjoyable companion for the young people. His growing spiritual hunger diminished neither his common sense nor his sense of humor. In Kenosha, Hans’s love for street meetings drew him to Pentecostals, led locally by George Finnern. Besides the Salvation Army, the Finnerns conducted the only regular weekend street meetings in town, and Hans Waldvogel asked permission to join them. To his surprise they welcomed him warmly, though he did not leave his father’s church. Over the next months they made him welcome in their home and answered many of his criticisms of Pentecostals. Hans began to feel tugged in his heart toward Pentecostal experience. 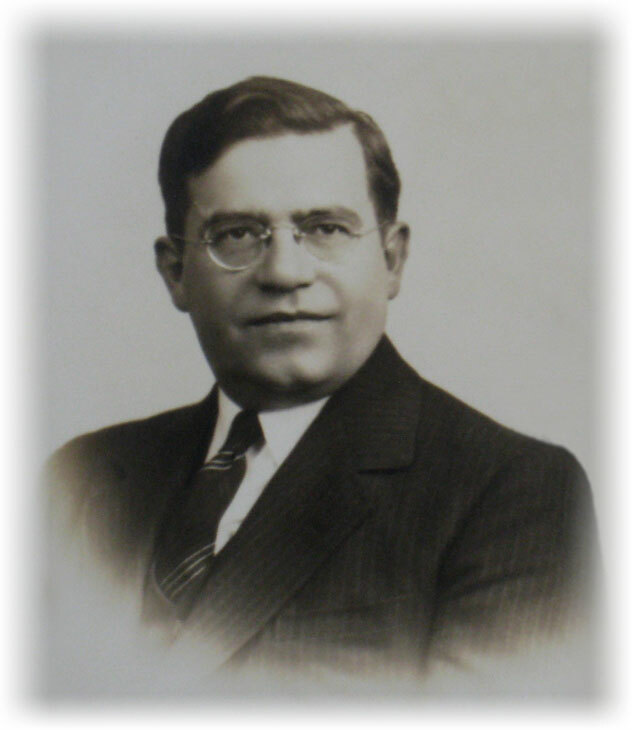 His decision in June 1920 to leave his job and his father’s church, join the Pentecostals and enter full-time ministry with the Finnerns came only after months of agonizing about the painful separations he knew the choice would entail. He esteemed his parents for their godly example; he had a prominent place of service within their church; yet he was convinced God was leading him by a different path. He did not know just how the door of opportunity would open, but he clung to a verse that became one of his life texts: “Commit thy way unto the Lord; trust also in him; and he shall bring it to pass” (Psalm 37:5). Although he was the first of the family to leave the German Baptist church, Hans Waldvogel was not the first to embrace Pentecostal experience. Gottfried’s friends at the Chicago Hebrew Mission had recommended that he attend the Christian and Missionary Alliance’s Missionary Training Institute at Nyack, New York. After his disillusionment with the Baptist Seminary, Gottfried acquiesced. He arrived at Nyack in 1910, just in time to participate in the last phase of the Pentecostal revival that had erupted at the school several times since 1907. He received the baptism in the Holy Spirit, and his family observed a new intensity in his spiritual life, but he did not leave the Baptist church. He filled various pulpits on a short-term basis, as far from Chicago as Baltimore, then accepted a call to Texas. There he met and married Lydia Sievers, the daughter of a German Baptist pastor. After a brief stint in Waco, the two moved to the German Baptist parsonage in Peoria, Illinois. Gottfried soon gained a reputation among mid-western German Baptists as a Bible teacher and a music leader. Most regional German Baptist gatherings found him organizing impromptu music or a preachers’ quartet. The Waldvogel sisters also found places of service. Anna mar­ried a Swiss German Baptist pastor, Otto Roth. Rose became a home missionary affiliated with the German Baptist Church in Oak Park, Illinois. Lydia married Fred Lehr, a pastor in Cleveland and then in Iowa. Elisabeth attended Moody Bible Institute and mar­ried William Scharf. The two offered themselves as missionaries but were denied appointment for health reasons. Instead, they moved to Los Angeles where they threw themselves wholehearted­ly into the work of an energetic evangelical endeavor, the Church of the Open Door, in its heyday. The children’s choices gratified their parents—until Hans— their closest in day-to-day association—left them for the Pentecostals. Over the next few months several others followed him out of Kenosha’s Immanuel Baptist Church. For a time Hans remained superintendent of the Baptist Sunday school, but opposi­tion among Baptist members forced him to resign. Adam and Anna Waldvogels’ declining health complicated this final cutting of min­istry ties and prompted Rose Waldvogel to leave her post in Oak Park and move her membership to her parents’ church. She helped them at home and tended needs in the congregation. Hans Waldvogel’s apprenticeship in Pentecostal ministry with the Finnerns in Kenosha yielded some lasting convictions, espe­cially about the importance of altar services, daily morning wor­ships, and protracted times of “waiting on God.” The Finnerns also took him to the Zion Faith Homes, an independent Pentecostal fellowship a few miles south of Kenosha in Zion, Illinois. He attended his first Zion meeting on Thanksgiving evening in 1919, before he left the Baptist church. In the Faith Homes, he came to know the ministers, Martha Wing Robinson, Loretta M. Judd, Eugene and Sara Brooks, and, among other workers-in-training, a young man with whom he formed an especially fast friendship, Joseph Wannenmacher. Also in Zion he met Max Wood Moorehead, a one-time missionary to India whom the Waldvogels had first encountered in the pages of Otto Stockmayer’s magazine years before. Hans knew that his father admired Moorehead, and Moorehead had since become a Pentecostal. Soon Moorehead would directly influence the course of Hans Waldvogel’s ministry. But first, Hans Waldvogel left Kenosha in 1923 to spend a few months living in the Zion Faith Homes. He had already begun occasionally supplying pulpits in Chicago and in the German Pentecostal Church in Milwaukee. In Milwaukee, he met the pastor of the German Pentecostal Church in Benton Harbor, Michigan and accepted an invitation to hold meetings in that largely German lakeside community. Then Max Moorehead encouraged him to think about going east and recommended him to Noel Perkin, pastor in Fredonia, New York, for evangelistic services. From Fredonia, Hans accepted an invitation to a German congregation in New Castle, Pennsylvania. There he met Philip Brauchler who told him about the struggling mission on Brooklyn’s Patchen Avenue. Next, Buffalo beckoned; then Rochester. After Rochester, he returned to Buffalo where the German congregation offered him its pastorate. But by then he had in hand an invitation to Brooklyn, and he felt inclined to accept. In April 1925, as he prepared to go to Brooklyn, he took to heart a text that became his lifelong confidence: “My presence shall go with thee, and I will give thee rest” (Exodus 33:14). The handful of people who invited Hans Waldvogel to Brooklyn had been deeply divided by the Pentecostal movement. Some objected to what they called “Pentecostal manifestations,” and in the first meetings evangelist and congregation had to find common ground. Hans Waldvogel had learned in the Zion Faith Homes that one should allow God to work in His way and time. Since he believed God had sent him to Brooklyn, he persisted, trusting God to touch people’s hearts in His way at His time. More people came. And unusual things happened. The second Sunday night, the congregation sat for a long time in absolute silence—something entirely new to them. They soon grasped Hans Waldvogel’s view that Pentecostalism need not express itself in fanaticism or noise. Rather, it included praise and silence, both operations of the Spirit. After two weeks, both Hans Waldvogel and the congregation concluded that their relationship should continue. In June, Hans briefly returned to Kenosha where he was ordained 25 June 1925. In July, Hans Waldvogel held his first baptismal service. The Patchen Avenue mission was now too small, and the congregation sought and fitted out new quarters. They rented a second-story hall at the corner of Seneca Avenue and Cornelia Street, in the heart of Ridgewood, a rapidly developing neighborhood favored by new German immigrants. Across the front of the hall (which they billed as their “new cheerful home”) they mounted the words ALL FOR JESUS. The congregation marked its new beginnings with two weeks of special services featuring Loretta M. Judd from the Zion Faith Homes. In February 1928 Hans Waldvogel visited his brother, Gottfried, then the pastor of the German Baptist church in Steamboat Rock, Iowa. Gottfried and Lydia had eight sons and a thriving church that drew German farmers from the surrounding area. During Hans Waldvogel’s visit, special services took on a Pentecostal flavor. Four months later, unwilling to split the Steamboat Rock church, Gottfried Waldvogel resigned and moved his family to Zion, Illinois. They lived near the Faith Homes and assumed responsi­bility for the Full Gospel Tabernacle, a modest Pentecostal church in nearby Waukegan. Their oldest son, Walter, soon left for New York to live and work with his Uncle Hans. In 1930 their second son, Edwin, joined Walter in New York to finish school at Richmond Hill High School and to assist in the expanding efforts of the Ridgewood Pentecostal Church. For the rest of his uncle’s life, he devoted himself to doing whatever it took to facilitate Hans Waldvogel’s ministries. In 1934 the rest of the family followed, and Gottfried Waldvogel became his brother’s associate pastor. The brothers’ complementary gifts as pastor and evangelist enabled the expanding ministries of the next decades. By 1930 the Ridgewood Pentecostal Church had acquired a home in which workers could live and would-be workers could train for the ministry. The large house at 84-20 85th Drive Woodhaven, known as the faith home, was often filled to capacity. Late in the 1920s both Adam and Anna Waldvogel died—Adam after a long bout with cancer, and Anna after a series of heart attacks. They were buried in Chicago’s Graceland Cemetery, in the neighborhood of their first Chicago pastorate. And before their deaths, they reconciled with Hans. Joseph Wannenmacher helped soften Adam’s objections to Pentecostalism, and Hans had the joy of hearing his father affirm his decision to pastor an independent church in which he could freely proclaim the gospel. Hans Waldvogel had purchased a home in Kenosha for his parents. Now his sister, Rose, closed the house and moved to New York to assist her brother in the faith home and the church. Uncle Hans and Aunt Rose had two of their nephews with them. Before long, another niece and nephew followed: Wally and Norman Roth. Norman stayed just a few years, but Wally devoted the rest of her life to assisting her uncle in the church, especially as organist. Active in the Sunday school and other children’s efforts, she helped run the church bookstore and quickly gained the affection of young and old. Over the years, the congregation in New York as well as hundreds in churches across Europe came to call her “Aunt Wally.” Her most prominent post in the church was as organist, but she was talented personal worker as well as the children’s friend, and she soon gained a reputation as a cook, too, entertaining large groups of the congregation at various church functions at the faith home. In her later years, she cooked at Pilgrim Camp. Devoted especially to assisting the church’s outreaches in Europe (where she spent several months each year), she made her home among her extended family and—especially after the death of Rose Waldvogel—played an important role at Uncle Hans’s side. Her music, her cooking and baking, and her sewing and knitting as well as her love for others endeared her to many in the Ridgewood Pentecostal Fellowship. Daily morning worships at the faith home and a day of prayer on Wednesdays continued the priorities Hans Waldvogel had embraced early in his ministry. Participants in the morning worships read through the New Testament chapter by chapter and took time to comment. When they finished, they simply began again, and so it went year after year. And they sang through the hymnal in the same way—three or four hymns a day, all the way through, and then back to the beginning. This gave the workers a strong grounding in the New Testament and familiarity with a large repertoire of hymns, and morning worships also built a sense of common purpose among those workers whose responsibilities took them different ministry points. The Ridgewood Pentecostal Church was a faith work. No one received a salary or benefits. This was just one of the ways that the church differed significantly from many emerging Pentecost churches. The absence of men’s and women’s ministry programs well as the full schedule of services, German and English, gave the church calendar a unique rhythm. The ministry emphasis on Christ rather than on the Holy Spirit combined with an unerring commitment to the Bible to forge a congregation less focused on spiritual gifts or signs and wonders than on knowing and obeying the Word. The self-conscious attempts by leaders to allow Christ to have His way in every gathering as well as in their moment-by-moment lives challenged the congregation to expect different kinds of meetings than those typical in many churches around them. The church never insisted on speaking in tongues as “the uniform initial physical evidence” of the baptism in the Holy Spirit, nor did it hold to dispensational premillennialism—both standard emphases in the larger Pentecostal movement. Rather, Hans Waldvogel understood the purpose of the Pentecostal movement to focus in Christ and Christ’s revealing himself in the hearts of believers, empowering them to be as well as to do. While much of American Pentecostalism focused outward, he looked inward. His father’s mentoring, Stockmayer’s ideas, Andrew Murray’s teaching, Moody Church associations, and the ministers of the Zion Faith Homes ground the lens through which he understood the Christian life. In 1933 and again in 1937 Hans Waldvogel returned to Europe. As the European political and economic crisis expanded through the 1930s, German-speaking immigrants sought new lives in New York, the congregation grew, and reports of the troubles relatives faced at home in Germany and Austria became more persistent. Concern for relatives in Germany grew in the congregation through the years of World War II, even as many of the church’s young men served in the armed forces in Europe and Asia. In 1947 Hans’s friend, Joseph Wannenmacher, traveled to Switzerland for the first meeting of the World Pentecostal Conference. He soon began sending urgent requests for Hans to join him, and he finally prevailed. The two enjoyed ministry togeth­er in German-speaking Switzerland; then Hans Waldvogel crossed into Austria and Germany. He could move freely through the American Zone, and what he saw transformed the rest of his life. In Frankfurt, he passed a group of Christians holding a street meet­ing. After a brief conversation, the leader begged him to return to hold evangelistic services. His own observations confirmed what he heard in Switzerland, Austria, and Germany: While those dis­possessed by World War II appreciated CARE packages from America, they hungered even more for the clear preaching of the gospel. When Hans Waldvogel returned to New York just in time for Christmas, he wept when he tried to describe what he had seen. Edwin Waldvogel suggested that they try to obtain a tent for evan­gelistic services, and his uncle agreed. In 1948, with the hearty support of the congregation, Hans and Edwin and Edith Waldvogel spent several months in Europe evangelizing, assessing ministry opportunities, and contacting relatives and ministers displaced by the war. Early in the 1950s Walter and Bertha Waldvogel moved to Germany where they assumed responsibility for one of the resulting new congregations, the Pfingstgemeinde Kirchheim/Teck. In old-fashioned Pentecostal lingo, all of these efforts together—Hamburg, Wuppertal, Moers, Kirchheim, Salzburg, Linz, Vienna, Schaffhausen, and several congregations in Yugoslavia—came to be known in New York as “the work” in Europe. This “work” consumed months of every year for the rest of Hans Waldvogel’s life as he worked to encourage and build the congregations that emerged from his post-war evangelistic efforts. The association with Germany, Austria, and Switzerland strengthened the Ridgewood church as well as its European counterparts. The death of Gottfried Waldvogel in 1953 at the age of sixty-three necessitated changes at home to enable “the work” in Europe to continue. In his uncle’s absence Edwin Waldvogel took responsibility for German services and stepped into his father’s place as associate pastor. In 1956 Rose Waldvogel died. Her capable personal work had made her an invaluable asset at her brother’s side. Growing commitments in Europe did not preclude a range of new efforts at home. Chief among these was the development of Pilgrim Camp, an effort enabled by Hans Waldvogel in 1946 and overseen by a board of trustees with Gordon and Caroline Gardiner as directors. Karl and Gertrude Sailer moved from Ridgewood to oversee and improve the thirty-acre camp property at Brant Lake in the Adirondack Mountains. Their home became home as well to two Austrian families orphaned by the war and brought to New York by the Ridgewood Pentecostal Church—the Baumgartners and the Schrecks. Margaret Sager, a nurse from Switzerland, took oversight of these young people and also began a lifetime of serv­ice as Pilgrim Camp nurse. Soon John Schreck and Elsa and Hermina Baumgartner joined the faith home family in New York. In the 1950s John Schreck, Robert Kalis, and a young minister from the Ridgewood Church, Walter Fette, assisted Hans Waldvogel in Europe. Sister churches in Germany sent some young people to the faith home, too, among them Monika Kleinbach and Siegfried Maier. Another advance on the home front was a new building suited to the changing needs of the congregation. The building—origi­nally a Presbyterian church whose cornerstone was laid in 1928—was typical of neighborhood churches of the era. In 1945 Karl Sailer, Edwin Hergenrother, and Edwin Waldvogel oversaw much of the renovation that turned the gymnasium into a second audito­rium suited for worship services and Sunday school. Later, the front choir loft of the sanctuary (at first used regularly by the German choir) was removed and the platform area renovated. Dedicated during the congregation’s twentieth anniversary celebra­tion, the building was centrally located in a thriving German neigh­borhood. The church contained a small pipe organ, and Wally Roth played it adeptly when she was not abroad as organist for meetings in Europe. Regular attenders noticed her evident gift to use music to complement her uncle’s ministry. The church at 457 Harman Street stood a few blocks from Wyckoff Heights Hospital where, organized by an energetic member named Helen Hoss and prodded by the visitation work of “Sister Frieda” Goetz, church young people had several years earlier begun singing and passing out tracts on Sunday afternoons. The faith home had also been put to other uses besides housing workers. It offered hospitality to missionaries passing through, and their ministries expanded the vision of the congregation and enriched its experience. In 1947 the congregation sent one of its own, Helen Hoss, to South Africa. A few years later, Pearl Young and Elisabeth Lindau left for Taiwan. Other missionary “regulars” at the faith home included Gottfried and Christine Bender, old friends of Gottfried Waldvogel from Nyack days. Hans Waldvogel preached for the Benders in Venezuela, and the congregation in New York enjoyed their frequent extended visits. The Olson brothers—Yngve from Venezuela and Lawrence from Brazil—had known Hans Waldvogel as their Sunday school teacher in Kenosha. As missionaries on furlough, they considered the Ridgewood Pentecostal Church one of their “homes.” The Bards from China; Louise Schultz from Hong Kong; Kathryn Roth from Kenya; Clara Lewis and Janet Grothman from Liberia; the Loutons and Pettengers from South Africa; Anne Eberhardt, Florence Dreyfus, Margaret Michelsen, Adeline Grieger, the Ericsons, Valborg Frandsen, and other “old-timers” from India regularly spent weeks in the faith home seeking their own renewal as well as enriching the fellowship of New York congregations. From the 1950s preachers from Germany came, too, further strengthening the ties to Europe. In the 1960s when Hans Waldvogel’s travels began taking him to Taiwan, ministers from the fellowship established there by Pearl Young and Elisabeth Lindau also took their places in the faith home and at Pilgrim Camp. Hans Waldvogel knew the importance of building a sense of fellowship that would nurture those who had contact with the Ridgewood Pentecostal Church. To this end he encouraged the publication, first of the Ridgewood Pentecostal News, and, from 1951, of the Bread of Life. Edited by Gordon Gardiner, the papers presented missionary news and devotional materials supporting the growing fellowship’s special emphases. The Bread of Life had a monthly circulation of about one thousand, and as people moved away, it served an important role of keeping in touch. It ceased publication after Gordon Gardiner died in 1986. The church also helped sponsor a German paper, Sieg des Kreuzes. This was prepared in Germany by Oskar Lardon, and it circulated widely among German-speaking Christians here and abroad. The church also helped prepare a German hymnal, Siegesklänge, published in Germany by Oskar Lardon with substantial assistance from Hans and Walter Waldvogel. (Each con­tributed text; Walter Waldvogel also contributed music.) Hans Waldvogel had an interest in new technology and took advantage of radio opportunities, sponsoring a live English broadcast over WWRL for several years from 1936. During the 1960s and 1970s Edwin Waldvogel prepared German broadcasts that aired on Sunday evenings in New York and on Radio Luxembourg in Europe. These consisted of Hans Waldvogel’s sermons and of music, often arranged by Walter Waldvogel and sung by his choir in Kirchheim/Teck. Hans Waldvogel’s interest in technology made possible an extended tape outreach as well as radio broadcasts. When Hans Waldvogel died on 24 March 1969, his efforts had taken him around the globe several times. In the work of mission­aries, publications, and congregations that identified with the emphases of the Ridgewood Pentecostal Church, his legacy contin­ued. At home his nephews, Edwin and Arthur, together with Gordon Gardiner, assumed full responsibility for the Ridgewood Pe ntecostal Church, Pilgrim Camp, and the faith home. Walter Waldvogel had a leadership role among German pastors and served the Pfingstgemeinde Kirchheim/Teck until his death in November 1977. For many years Arthur Waldvogel faithfully conducted the German-language Yorkville Gospel Hall until demographic changes in the 1970s eliminated the opportunity. Gordon and Martha Waldvogel, who had co-pastored with Anna Schuette at the Williamsburgh Pentecostal Church (from Gordon’s ordination in 1951) until she died in 1965, had taken on the challenge of leader­ship there. Alfred Waldvogel assisted the Oldfields, then the Bowers, at Canarsie; Herbert Waldvogel and others served the congregation in Pelham Bay; the Postas ministered on the East Side and, beginning in 1961, at the Church of the Good Shepherd in Ozone Park; in 1954 Fred and Eleanor Pra joined the ranks and pioneered a church in Floral Park. Through the ambitious neighborhood vision of long-time attenders Karl and Maria Hetzel, in the 1960s the Ridgewood Pentecostal Church began sponsoring an outreach in a nearby predominantly Hispanic area. Over the years, the ethnic mix of the neighborhood around the Ridgewood church had changed several times. What had once been primarily German became staunchly Italian, and Spanish-speaking people as well as eastern Europeans moved ever closer. German families and businesses slowly moved out, some stopping in nearby Glendale, and others finding their way to Long Island, New Jersey, and northern counties. The lack of parking and the changing character of the neighborhood affected the Ridgewood Pentecostal Church in various ways; but this outreach in the predominantly Hispanic area—known as the Wilson Avenue Mission (later Wilson Avenue Pentecostal Church)—led first by Sarah Gerbino Klaus and later by Kenneth Ott, represents the commitment to serve a newer neighborhood constituency. Expanding efforts among recent Chinese immigrants also impact the congregation’s ethnic mix. Those who called Hans Waldvogel to Brooklyn in 1925 are gone now. But some of their children and grandchildren remain, and many more keep in touch. Pilgrim Camp has become a meeting place for many who once lived close enough to attend services at Ridgewood. The church’s German services continued until 1996 when they were no longer needed; but contacts with Germany remain strong, and groups of young people as well as ministers from the churches in both countries visit as occasion allows. After Uncle Hans’s death Edwin Waldvogel regularly took his place at annual Pentecost conferences hosted by the church in Kirchheim/Teck. Over the years the fellowship churches have grown and adapted to new circumstances. Ivan and Ethel Bowers followed the Oldfields at Canarsie Full Gospel Chapel. When they retired in 1992, John Schreck, their associate of over twenty years, assumed the oversight of the church. He and his wife Elsa have carried the work forward and seen it grow. Their son-in-law, Kenneth Friedmann, is their capable associate pastor. When Frank and Emma Posta retired from the pastorate of the Church of the Good Shepherd in 1982, Ernest Waldvogel (who had worked with the Postas for two years) assumed responsibility for the congregation. Under his leadership, the church in Ozone Park has grown. In recent years they expanded their space to capacity, and the building is filled every Sunday. A new work in Rockaway Beach is led by Garry Patrylo. After coming into the Ridgewood Fellowship through his affiliation with the Canarsie Full Gospel Chapel, Garry was burdened for his old neighborhood and returned to Rockaway Beach to establish The House on the Rock. In January 2000 Gordon and Martha Waldvogel celebrated their golden wedding anniversary. They continue to serve the Williamsburgh Pentecostal Church, now assisted by their son, Philip John Waldvogel. The Williamsburgh church moved from 608 Grand Street to 674 Metropolitan Avenue in January 1960. In 1972 and 1980 the congregation expanded by purchasing the three-story buildings on either side of the church to help facilitate a grow­ing Christian education program. When Fred Pra, pastor of the Floral Park Pentecostal Church, died in 1977, his wife, Eleanor, continued to serve the church (known as Calvary Full Gospel Fellowship) with the assistance of their son, Mark. In New Jersey, James and Grace Schultheis and their church in Keansburg are part of the Ridgewood Fellowship. With other Fellowship ministers, they share leadership responsibil­ities every summer at Pilgrim Camp. Recent missionary outreaches include Tortola in the British Virgin Islands. After political turmoil forced them from Liberia, Clara Lewis and Janet Grothman turned their efforts toward Tortola. Soon after veteran missionary Clara Lewis died, Veta Greenwood, an English immigrant who had found her church home at Ridgewood, joined Janet Grothman. Together they oversee thriving children’s ministries on several islands as well as adult outreaches and radio broadcasts. Taiwan missionary Gerda Bocker oversees a growing Chinese-language evangelistic effort based in Woodhaven, Queens. A monthly publication, Things New and Old, is assembled by Edwin and Monika Waldvogel, assisted by Aletha Freeman. It offers inspirational and instructional material focusing on the Ridgewood Pentecostal Church’s particular emphases. Monika Waldvogel takes responsibility for Die Botschaft vom Sieg des Kreuzes, a paper sent monthly throughout the United States, Canada, and German-speaking Europe. Those who—like me—grew up in the Ridgewood Pentecost Church in its middle years remember the church as the center of our lives. The rhythm of services, weeks of prayer, and special efforts like the Sunday school parade, Vacation Bible school, or singing at various hospitals shaped priorities. Saturday morning services served some whose schedules precluded their attendance at week-day morning worships. Morning worship at church on every holiday attracted such people, too. Christmas programs on Christmas night and meetings at fellowship churches on the few nights the Ridgewood Church had none nurtured the conviction that spiritual things mattered most. On special holidays German and English congregations met together, both choirs sang, testimonies were welcome in either language, and hymns and Bible readings were done in both languages simultaneously, though the preaching was generally in English. Those who regard Hans Waldvogel simply as a spiritual leader miss something of who he was. No one could tell a better story, manifest a more lively imagination, or be more thoughtful. Simply put, he was a good companion, and—despite the best efforts of some to insist that he lived on an ethereal plain—his piety was always down-to-earth. To my brother, sister, and me, Uncle Hans took the place of his brother, our grandfather, whose early death meant we never really knew him. Those who came to the church later—or who knew only its English-language side—also miss something of the man most fol­lowed his family to call simply “Uncle Hans.” Since the language of Hans Waldvogel’s primary spiritual formation was German, the hymns that best expressed his piety were often the German songs he had memorized in childhood. Each Sunday morning—with as much liturgical regularity as the church ever mustered—the service concluded with the congregation singing from memory all the stan­zas of the old German hymn, “So nimm denn meine Hände, und führe mich” (“Take Thou my hand, and lead me”). As I recall those days, I can almost hear other occasions when Uncle Hans started—and Maria Hetzel kept the congregation going through all the stan­zas of—”Solang’ mein Jesus lebt.” The Waldvogel family had long treasured another hymn that especially characterized Hans Waldvogel’s yearning: “Jesu, geh’ voran auf der Lebensbahn, und wir wollen nicht verweilen, Dir getreulich nach zu eilen.” This invitation to Jesus to lead and the promise to follow captures Hans Waldvogel’s personal determination and the vision he and his suc­cessors have held before the people they serve.